Imagine buying a multimillion-dollar home only to tear it down. 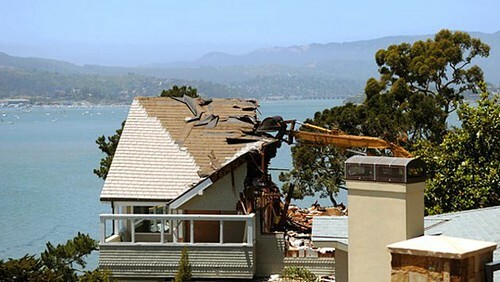 A couple in Belvedere, California did just that when they purchased the house next door to theirs for $4.2 million and then demolished it. While this move might sound crazy to the average American, it’s actually very common in Belvedere, an affluent city in Marin County that boasts golden properties, some of which are located on mountain cliffs with views of San Francisco, the Bay Area, Sausalito, the Golden State Bridge and Mount Tamalpais. ABC News reports that Clark and Sharon Winslow bought the mansion next door to theirs for the sole purpose of tearing it down in order to “improve their view” and “plant some bushes.” Purchasing a home to improve a view is not only common in the area, it’s considered property enhancement. With a population of 2,068, Belvedere is essentially two islands with a lagoon between them. The large island is called Belvedere Island, while the smaller one is Corinthian Island, shared with Tiburon.